History never is simple; which is a good thing. When and where was the copper crusher (Cornish rolls) invented? A simple question, but with two answers. ” the first ever roller crusher was created in 1808 in Devon at Wheal Crowndale copper mine near Tavistock, then managed by John Taylor. His experimental machine was water powered and apparently used two pieces of cast iron rising main (pumping pipes), but chilled cast iron became the standard material, due to the considerable force needed to crush the mineral.” Industrial Archaeology of the Tamar Valley Research by Robert Waterhouse FSA, assisted by the Morwellham Archaeological Group, 2002-2010. None of the many books on my shelves that cover the invention include both stories, and Roger Burt in his biography mentions neither, so which one is correct? A possibility exists that both are, that is the young Taylor played around with pump mains at Friendship to arrive at a working model, and once the concept was proven built his first productive crushed at Crowndale. Although this of this chain of events makes sense, it leads to the conclusion that John was involved with Wheal Friendship two years before that fateful day when he was offered its management. It means that at the age of 17 he was already tinkering away with engineering ideas at the mine, if so it makes that blatant act of nepotism of 1798 (see earlier post) less surprising then it first appears. Tin and copper ore demand different dressing floors to release the wealth from the rock. Tin dressing floors were packed with machinery, copper floors full of women and children. This was a difference enforced by the nature of the minerals. Tin was dense, and could be liberated by stamping the rocks to a sand that was then separated from the waste rocks in a wide range of buddies, pits, frames, shaking tables, and other assorted devices that relied on it being denser when suspended in water. Copper was lighter and had an unfortunate tendency to break into too fine particles under the heads of stamps. The two characteristics resulted in too much ore escaping the system if the rock was stamped. Copper ore was therefore treated by a series of processes such as bucking, cobbing and spalling. All processes that described hitting the rocks with hammers. John Taylor’s achievement was to replace part of this manual intensive work with a machine. A machine that took lumps copper ore and crushed it to a smaller size, but without causing large losses that a set of stamps would cause. Like all good inventions, Taylor’s design was simple. 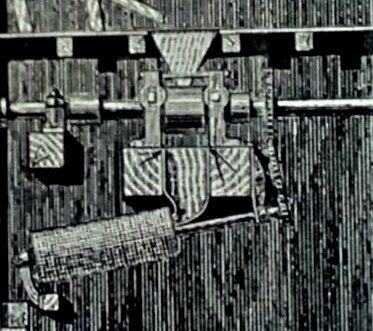 Ore was fed from a hopper between the two rolls, which were geared to turn inwards against each other, crushing the ore. A weighted arm was used to maintain the correct pressure on the rollers. The concept was similar to one used on apple crushers, perhaps they were the inspiration for his invention. The next stop on this wander around John Taylor’s life will take this blog far away from the Devon countryside into the depths of the Welsh Mountains. Click here for my Amazon home page. Whilst this series of posts have a tendency to focus on Taylor’s work in Cornwall and Devon, occasionally it will wander across Britain, and this is such a post. 1812 was the year in which John Taylor made a surprising move, he resigned all active commitments in West Devon to established chemical works in Stratford Essex. This was a start of a several non-mining interests of Taylor and Sons, but as they fall outside of my Trevithick Society talk I will resist the temptation to dive down those rabbit holes in these posts. Taylor did not stay away from mining for long, and when he returned it would be on a North Wales mountain, many miles away from Devon. In 1813 he became the agent to Lord Grosvenor rich lead mines around Halkyn mountain in Flintshire.The Grosvenors had been successfully working these lead mines for generations, but by the 19th century the mines were in decline, and they brought in the young Taylor to rejuvenate their fortunes. The move to Flintshire was probably arranged through the Duke of Bedford’s agent, John Adams, who had acquired a great regard for his work at Wheal Friendship. But just as happened at Friendship, Taylor soon turned the opportunity offered by personnel contact into success. This remote mountain was the first site of a formula for success that Taylor and Son’s became renowned for; move into a flagging mine, import Cornish mining technologies and management systems, invest in modernising, and add some of Taylor’s tight financial control. His success at Halkyn launched a campaign of moving into almost every metal mining district in Britain. Seen from the stance of mine owners, investors and Cornish miners Taylor’s involvement in Flintshire mining was a resounding success. It enabled the mines to survive depressed copper prices to become the richest in the district. Many of the Welsh miners thought differently though. To them it was an erosion of conditions, and opposition to his methods would lead to industrial disputes and riots. Their were disputes about poor timbering , disputes about the rules he introduced, disputes about ventilation, and disputes about working hours. Such industrial unrest was rare in Cornwall, but there the ‘system’ had evolved alongside the miners culture, rather then imposed from the outside. Or perhaps the ‘Cornish’ system had evolved because of the working culture of miners West of the Tamar. It was the increase in the working day from six to eight hours that caused the most violent disputes. When Taylor and Sons attempted to introduce it to their Pant-y-go Mine, in 1850, 500 miners ransacked managers houses. The local police were powerless to act, and a detatchrment of the 86th Regiment was to regain control together with constables with drawn cutlasses. The strike lasted for twelve months, twelve months when both the mines and miners suffered badly. Their was damage to mine shafts, and miners sent for hard labour after conviction for riot. But the Taylor’s would eventually get their eight hour day when the men eventually gave in. To learn more about the riots pop across to the Flintshire lead mining website. To learn more about the ‘Cornish System’ follow this blog to catch the next post. Manufacturing Vitrol, producing gas from oil, refining sugar, manufacturing portable printing machines. Opposition continued however and the following year several hundred men demanded a return to 6 hours due to such wet unventilated conditions in the mine. As my talk at the East Cornwall Branch of the Trevithick Society approaches, so more posts about John Taylor will arrive on this blog. This one looks at his other West Devon mines. Soon after proving his worth at Wheal Friendship, John Taylor quickly expanded his influence in to other mines near Tavistock. In doing so he created a mining district that would link the wealth of the Stannary Town and Taylor together for many decades. John Taylor had a direct financial interest in its reopening this mine in 1879 and acted as its agent. This was only one year after his appointment at Wheal Friendship; an indication of his rapid rise in wealth and recognition of his talent. An important feature of the mine was its long wide leat, fed from a weir at Tavistock. This leat would form the basis of his best known engineering achievement, the Tavistock Canal, the subject of the previous post. A subject of a post to come is his invention at Crowndale of the copper crusher, or ‘Cornish Rolls’. For 10 years the mine was rich, even to the point of overtaking the success of Friendship. Unfortunately its richness was short lived and from 1810 its output declined. In 1824 Wheal Crowndale closed. A small scale re-opening occurred in 1850. This was linked physically and financially with the Tavistock Canal. At times the mine supported the finances of the canal, at other times the situation was reversed. Wheal Crebor was sunk at the eastern portal of the canal tunnel. Its hauling shaft is perched above the canal bank, deep in the tunnel lobby cutting. Crebor’s first ore sales were in 1805, and by 1809 the canal had reached the mine from Tavistock. Like Crebor its reserves proved short lived, with output diminishing after 1815. Canal profits were used for a while to support the mine, but it closed in 1828. Later workings by new companies occurred in the 1840s, 1850s and 1880s. Wheal Crebor finally closed in 1889. An impressive feature of the mine is the incline hauling shaft perched on the Canal’s entrance. This is a typical John Taylor piece of engineering, but one that is hidden away from public view on private land. This is the odd one out of Taylor’s Tavistock mines; lead not copper was contained within its ores. In 1816 the mine was managed as part of Wheal Friendship, and making a loss. 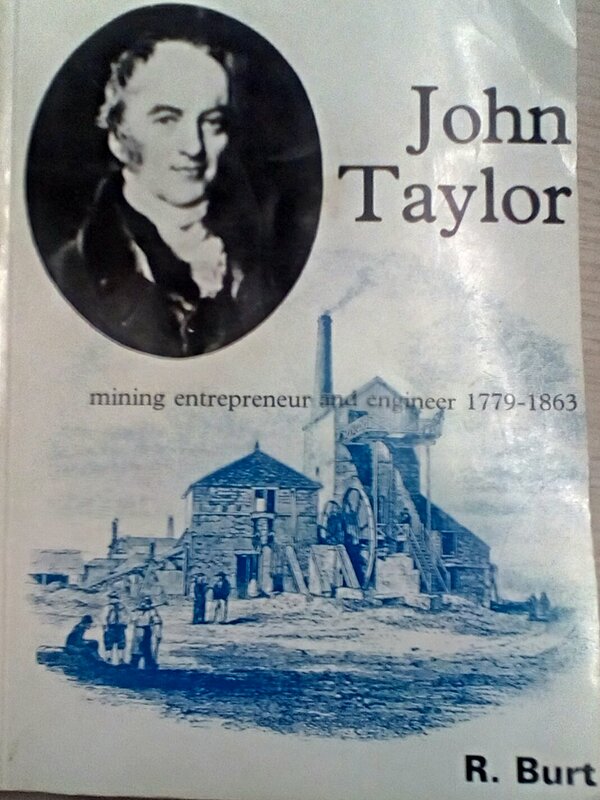 But by 1818 John Taylor had transformed the mine’s fortunes, and it was returning a profit. A major part of his work was building a leat from Hillbridge within the Tavy Valley. Depressed lead prices returned the mine to a loss by 1830. This instigated Taylor starting an adit from Wheal Friendship in 1835. In 1837 the mine was separated from Wheal Friendship, and the mine abandoned before mid century. In 1850 it was reworked as North Wheal Friendship and later as Prince Arthur Consols. This last working built the engine house that still stands beside the Mary Tavy to Okehampton road, one of the best known industrial heritage landmarks in Devon. Next post inbound …..the copper crushed, or as it became known the ‘Cornish Rolls’. As my preparation for next month’s Trevithick Society talk continues this blog will continue its ramble around the life of John Taylor- the Victorian Mining genius. In 1798, near Mary Tavy in Devon, there was an extraordinary event that transformed the life of the young John Taylor, and changed the economic fortunes of the Tavistock District. Sometime in that year the nineteen year old Taylor visited Wheal Friendship mine with members of the Martineau, family. The family were both major share holders on the mine and close family friends of the Taylor’s. And so, as members of two Norwich families met on the western border of Dartmoor, far from their homes, they made a daring decision, to give the young Taylor the management of the mine. Wherever it was Taylor’s genius so impressed the mine owners that they had to offer him the post, or that this was a blatant act of nepotism is hard to tell so far distant from the event, but either way it was a bold move. John had no experience in the mining industry, he was very young for the position and did not come from the area. It has been claimed that it was John’s comments made on the mine’s operations that swayed the Martineus on that day; whatever the reason they were never to regret their decision. John immediately started a transformation of the mine that he would repeat many times in his career. He secured the long term profitability of the mine with heavy investment in mechanisation and modern technology. He demonstrated a faith in the long term, rather than chasing quick returns. By 1801 he had started construction of a complex system of leats that enabled Wheal Friendship to build the most mechanised dressing floors in the South West, and made the mine the largest copper producer in the Tavistock District. In 1803 Taylor commenced a massive civil engineering project as part of the Mine’s infrastructure, the Tavistock Canal. But that will be a topic for a later post. Despite of this success, John took a surprising step in 1812 by resigning from his commitments in West Devon to establish a chemical works in Stratford, Essex. But this exile from Wheal Friendship was not to be permanent. For in 1816 the mine requested that he should return as Secretary to the committee of Management, a position with wide powers over the finances of the mine, and its day to day working. At the time of John’s return Friendship was being worked as joint concern with Wheal Besty, and the company was not in a good financial condition. But by 1817 he had cleared the debts, and by 1818 both mines were in profit. On December the 1st the sole responsibility of running the mine passed to John, in whose hands mine prospered for almost 50 years. The mine became the second largest copper mine in Devon, it would play a major part in the economy of the Tavistock area, make Taylor’s fame and much of his fortune. Water power played a major part in Wheal Frenship’s operations. Large leats contoured their way many miles from the rivers of Dartmoor to feed a complex, and well planned, system of water distribution on the mine. Among the many waterwheels on the sett was a huge 50 foot wheel at Old Sump shaft. Two wheels were built underground, one with 52 foot diameter was said to be the most powerful installed in Britain at that time (125 hp). Taylor believed in investment for long term profits, strategy that set him apart from many other mine owners of the day who operated mines to achieve rapid returns at the expense of long term profits. An example of this is use of incline planes. in 1826 he sunk a new incline plane at Friendship. It inclined at 40 degrees was 7ft high 5 feet wide. The wagon carried one ton of ore and was hauled by 40 foot waterwheel. Incline planes was one of John Taylor’s technical specialties. Although they required more capital to sink then traditional shafts they greatly improved the deficiency of hauling ore to the surface. In the 1930s the John Taylor’s leat was converted to supply the hydro electric power station at Mary Tavy. It is fitting that Taylor’s civil engineering achievements in tapping the power of the Dartmoor rainfall found use in the 20th century. This mine worked for 130 years. Activity started on the mine in 1769 (or 1870 depending on source). It was located both sides of the main road in Mary Tavy. Copper the principal product until the 1870s when arsenic became the main revenue earner. It reached a depth of 220 fathoms. In 1865 it was estimated that it had raised 145,805 tons of copper, 1170 tons of lead , 120 tons of tin and 4,343 tons of arsenic. In the 1880s it was revived by the Devon Arsenic company. Work ceased in 1900 resuming in 1907. Wheat Friendship was abandoned in 1925. In the 1930s the leat was converted to supply the hydro electric power station at Mary Tavy. I have wandered around the web amongst the many pages devoted to Cornish mining and have found many mentions of John Taylor. I have hunted, and hunted the pages covering Norwich history, and found not a mention. I have wanderd the streets of Tavistock in Devon and stumbled across several references to him. And yet my friends have explored the streets and museums of Norwich and never found a trace. 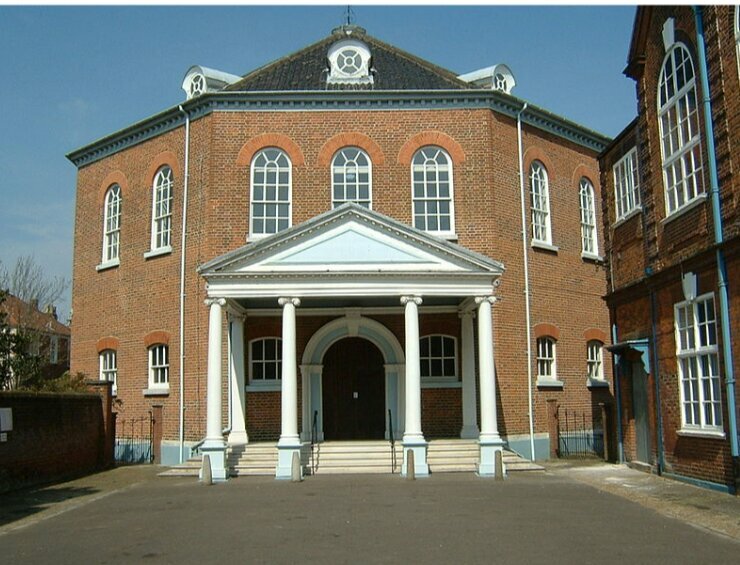 John Taylor was born at 75 Gildengate , now St. George’s Colegate, in Norwich. On 22nd August 1779. 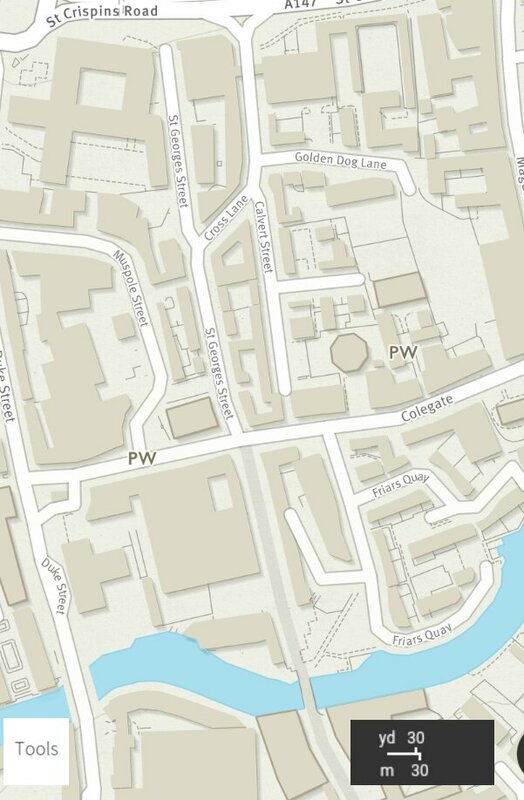 Nearby is the Octagon chapel founded by his Great Grandfather. He came from a closely knit dissenting family, whose Unitarian beliefs underpinned much of his future success. He was brought up with a ethos of maintaining close control financial matters and a strong sense of honesty. These traits influenced all is business operations, traits that were rarely found in the shady world of Victorian Cornish mining. His mother had an active interest in his education. John was given private tutoring, followed by a local day school. On completion of schooling he was apprenticed as a land surveyor and civil engineer. Valuable skills that he utilised to transform many a mine. Another Norwich influence that played a major part in Taylor’s success was the longstanding family friendship with the Martineau, a family who were also Unitarians. The Martineu’s were more prosperous then Taylor’s. Their interests included brewing, banking and sugar refining. Importantly for this story they also owned shares in Wheal Friendship, a copper mine on the western fringe of Dartmoor. The Matinue’s do have many mentions within the pages of Norwich’s history. A society even exists dedicated to their political legacy. Yet again however, John Taylor is absent from the story. I could not even find a mention of Wheal Friendship. Taylor was unique as a successful outsider in the Cornish Mining industry. A ‘wise man from the east’ who knew the industry better than those brought up amidst the engine houses and waste tips. His success was influenced by his up bringing in Norwich, and yet the town appears to ignore him. So, if you are an engineer, historian, or any other proud resident of the Norfolk town please consider doing your bit to raise his profile. Do not let the Cornish and Devonians claim all the credit for his work. Share this post if you agree. 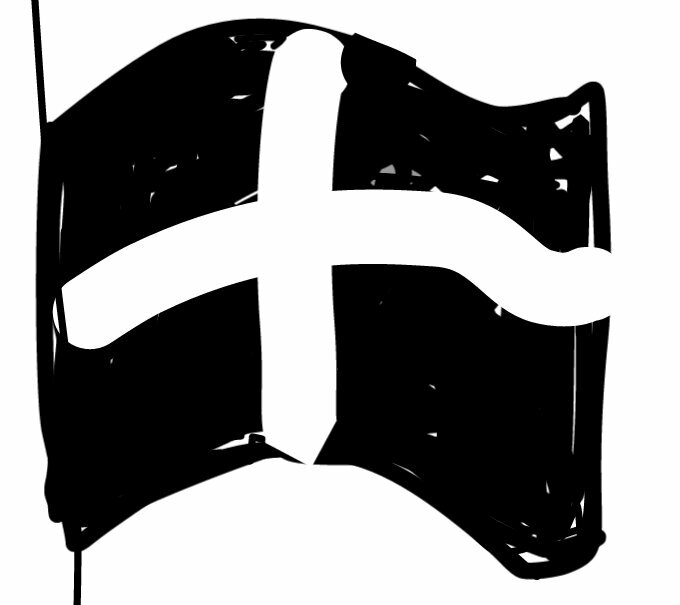 A flag drawn on the kindle as I crossed the Tamar in Cornwall last night on Brunel’s bridge. Into Kernow to celebrate St Piran’s. Key dates in John Taylor’s life, with a few additions from the life of William West. 1779 John was born on the 22nd August in Norwich. 1798: When aged 19 he visited mines in Tavistock area with the Martineau family. They were so inspired by comments that they invited him to take on management of their Wheal Friendship at Mary Tavy. 1799 Taylor reopened Crowndale mine near Tavistock. 1801 William West was born at Dolcoath in Cornwall. 1803 He laid plans for the Tavistock Canal before parliament, and an act obtained. John became engineer in charge. 1806 He developed copper crusher at Crowndale Mine. 1808 He invented a ventilation machine. 1808 Taylor emerged as leader and spokesman for mining interest. He represented mines in negotiations with Duke of Bedford. 1810 His Son Richard was born. His sons would become partners in his company. 1812 John resigned all active commitments in Devon area to established chemical works in Stratford Essex. 1813 He became an agent to Lord Grosvenor’s rich lead mines around Halkyn mountain, Flintshire. 1815 Taylor obtained Patents obtained to produce gas from oil, and to refine sugar. 1816 Wheal Friendship resolved to use his services. He became Secretary to the committee. 1817 He was involved in experiments in high pressure boilers and steam engines. 1816 The Tavistock Canal was completed. 1817 Taylor bought shares in Tavistock canal, and became a member of the trustee commitee. 1817 He took up temporary residence in Tavistock area. 1817 Taylor Instigated an overhaul of Morwellham quay on the river Tamar. 1818 Hebset up Consolidated mine, in Cornwall, out of Wheal Virgin, Wheal Fortune and others. 1818 Collaboration with the engineer Arthur Woolf started. 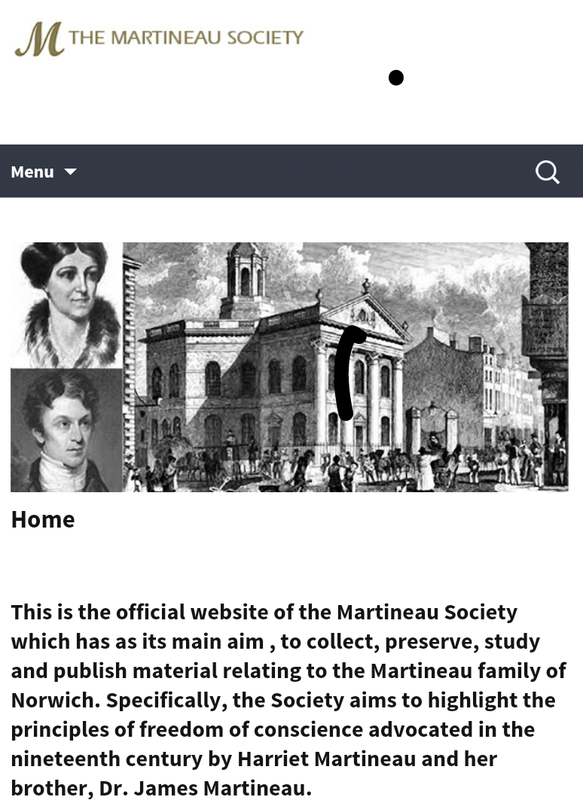 1819 Chemical works partnership joined by John Martineau. 1819 Consolidated mine commenced production. 1820 His business expanded into mechanical engineering, manufacturing, and produced portable printing machines for Mark Brunel. 1820 Taylor acquired Land in Tavistock, and built offices and other premises in a square that still bears his name. 1820s He acquired mines in the St. Austell District, including Poolgooth, Pembroke, Crinnis, and Charlstown mines. 1824 Taylor conducted trials conducted between high pressure single cylinder engines, and low pressure compound engines. 1824 The Redruth and Chacewater Railway act was passed.The railway company was launched by Taylor and his associates. 1824 Formed British Real del Monte company to work mines in Mexico at Regla and Moran. 1825 He published a prospectus for school of mines. 1826 Taylor became a founder member and proprietor of University College London. 1830s He published several articles in the philosophical magazine and mining review supporting high pressure steam engines. 1830 Arthur Woolf retired as engineer of Consolidated, John Hocking and Michael Loam took up the position. 1830 Taylor extended the Cornish system to Cumberland, Cardingshire, and Ireland. 1830s He acquired the Coniston Copper mine in Lancashire. 1830s Took up United Mines complex and other mines in Redruth area. 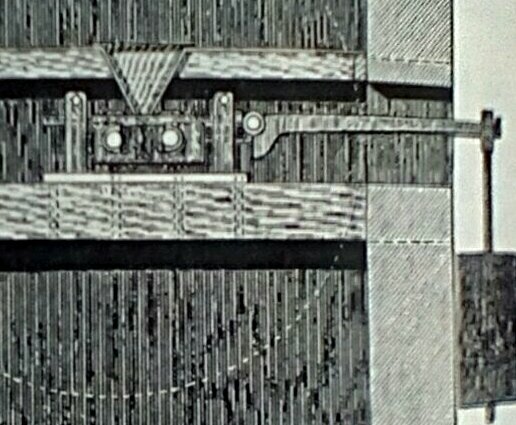 1831 Taylor developed a mechanical Jigging machine. 1832 He was a founding member of The British Association for the Advancement of science . 1834 Taylor set up s tin smelting works at Charlestown, this closed at end of year. 1834 He acquired the Lisburne Mines in mid Wales from Williams family of Scorrier. 1835 William West’s Austen’s engine achieves the maximum efficiency of any Cornish Engine. 1836 Taylor revived the Goginan Mines in mid Wales. 1837 His Sons became partners in the company. 1839 Taylor and Sons formed the Alport Mininng Company in Derbyshire. 1837 Queen Victoria’ s reign starts. 1839 He persuaded the British Association to publish Lean’s Historical Statement of improvements made into the Duty performed by Steam engines in Cornwall. 1840 Williams family took over Consolidated after a dispute over lease renewal. 1840s Taylor represents Cornish Mining interests in Parliment against reductions in tin and copper tariffs. 1848 The Mexican mines are wound up as failure. 1848 The Company took up Polberro Consols. 1848 The company obtained the Cwymystwyth mine. 1850s He had an interest in Nouveau Mond Gold Mining Company, California and Spain. 1850 Taylor illness may have been stroke or heart attack. In the aftermath he started a process of gradual retirement. 1852 The Alport company wound up as a failure. 1860 Retired from University University College. After 18 years as treasurer. 1860 Retired from the British Association. 1861 Taylor retired from business. 1863 5th April John Taylor died after long illness. 1969 John Taylor and Son closed.